Acura knocked the room for a loop with a haymaker called NSX. Here's the other end of the Acura excitement spectrum. It's the ILX, a car with which Acura hopes to attract younger buyers; older, downsizing urban dwellers, and those for whom a doctor has prescribed the avoidance of excitement of any kind. Don't be confused; the ILX isn't all-wheel-drive, despite the X in its name. Maybe it stands for "xenomorphic," which means having a form that's not all its own. The definition usually refers to minerals whose form is determined by the pressure on it from adjacent minerals. That could just as well apply to the ILX, since it's based on the Honda Civic, onto which the pressure of Acura's luxury needs have been thrust upon it. Trouble is, the latest model Civic suffers from a lack of refinement, a condition that could hamstring the ILX's rise to near-premium level. How well engineers will be able to plush up out the ILX's ride and engine sounds, add interior plushness and ultimately make it feel like a premium car. 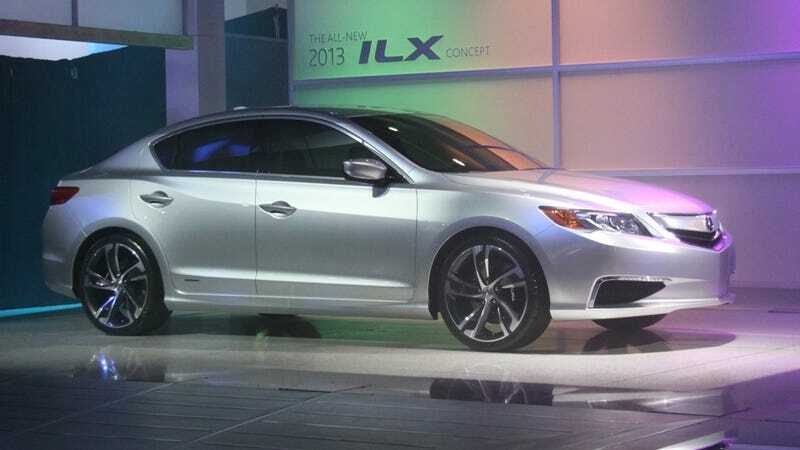 Acura says the ILX will get the Civic's 2.0-liter four at base, with an up-market 2.4-liter and 1.5-liter hybrid edition planned when it hits production later this year. It'll be built at the same Honda plant in Greensburg, Indiana as the Civic.